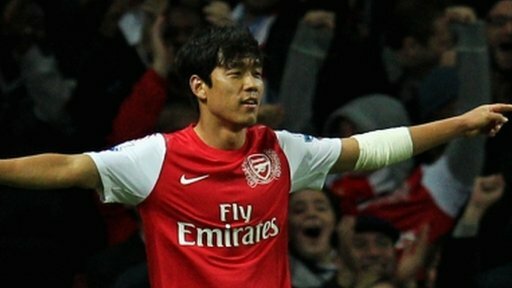 Park Chu-Young scored a delightful winner for Arsenal, who booked their place in the last eight of the Carling Cup at the expense of Bolton. The visitors took the lead after the break when Fabrice Muamba combined with Darren Pratley before driving his effort high into the Arsenal goal. Andrey Arshavin equalised for the Gunners with a low drive into the Bolton bottom corner. Arshavin then set up Park, who curled in his shot into the far corner. Arsenal have been very reliant on Robin van Persie this season, with the striker having scored seven of his side's 15 goals in the league. The Dutchman's replacements have failed to make the most of their own chances this season so far, but Wenger may have struck gold with South Korea captain Park. The forward led the line superbly at Emirates Stadium. He twice forced Bolton's Adam Bogdan to save at full stretch in the first half before finally beating the keeper with the winning strike. The goal was created by Arshavin, who drifted inside and ran towards goal, taking three defenders with him, before laying the ball off to his team-mate on the left. Park took one look at the goal before beautifully bending his shot just inside the Bolton left-hand upright. Arsenal's second had come only nine minutes after the Trotters had taken the lead through Muamba. The England Under-21 player dispossessed Emmanuel Frimpong 35 yards out and played a one-two with Pratley in the area before thrashing his shot into the roof of the goal. But six minutes later the Gunners were level. Arshavin picked up the ball 30 yards out on the left before driving into the area and slotting an angled shot into corner. Once behind, Bolton had enough chances to have equalised and even won it themselves, but they were thwarted by Lukasz Fabianski in the Arsenal goal. The Pole saved low to deny Gael Kakuta, Ivan Klasnic and Gary Cahill. He also prevented substitute Chris Eagles from scoring from distance with an unorthodox save that might have gone down as a keeping "howler" had it gone in. But finally his heroics, along with the skills of Park and Arshavin, ensured Arsenal reached the quarter-final stage for the ninth consecutive season. "Arsenal scored two goals from their two shots on target. They never had another shot on target. "We scored a very good goal to put us in front and looked to be the team in the ascendancy. "Then, from my end, the disappointing thing is as good as Arsenal's finishes were, they could have been avoided. "I thought Arshavin should have been closed down and we paid a heavy cost for that. "Then we gave the ball away cheaply and got punished by Park with a sublime finish. "From that moment on it was waves of attacks and not just that but clear goalscoring opportunities. "We should have buried them, we never did and now we're out of the cup because of it." 90:00+3:44 The final whistle is blown by the referee. 90:00+3:28 Header from close in by Gary Cahill misses to the left of the goal. 90:00+1:48 Corner taken by Robbie Blake from the left by-line, Headed effort from inside the box by Zat Knight misses to the right of the target. 90:00+1:36 Gary Cahill takes a shot. Ryo Miyaichi gets a block in. 89:39 Free kick awarded for a foul by David Ngog on Nico Yennaris. Yossi Benayoun takes the direct free kick. 87:53 Yossi Benayoun challenges Ricardo Gardner unfairly and gives away a free kick. Ricardo Gardner restarts play with the free kick. 86:54 Strike by Ivan Klasnic from inside the six-yard box clear the bar. 84:40 Substitution Tuncay Sanli leaves the field to be replaced by Robbie Blake. 83:58 Substitution Daniel Boateng comes on in place of Thomas Vermaelen. 83:46 Shot from outside the box by Chu-Young Park goes wide right of the target. 82:06 Gary Cahill takes a shot. Save made by Lukasz Fabianski. 81:14 Unfair challenge on Mark Davies by Francis Coquelin results in a free kick. Shot comes in from Chris Eagles from the free kick. 77:56 The referee blows for offside against Chu-Young Park. Gary Cahill takes the indirect free kick. 76:55 Corner taken right-footed by Chris Eagles from the right by-line to the near post, Francis Coquelin manages to make a clearance. 76:31 Corner taken by Chris Eagles from the left by-line, Gary Cahill takes a shot. Save by Lukasz Fabianski. 75:58 Ivan Klasnic takes a shot. Save made by Lukasz Fabianski. 75:30 Substitution Oguzhan Ozyakup on for Emmanuel Frimpong. 73:24 Short corner taken by Chris Eagles. 73:08 Chris Eagles takes a shot. Save by Lukasz Fabianski. 72:11 Substitution Ryo Miyaichi on for Alex Oxlade-Chamberlain. 70:43 Substitution Chris Eagles replaces Gael Kakuta. 69:19 Francis Coquelin challenges Mark Davies unfairly and gives away a free kick. Gael Kakuta has an effort direct from the free kick, save by Lukasz Fabianski. 67:23 Unfair challenge on Emmanuel Frimpong by Fabrice Muamba results in a free kick. Lukasz Fabianski takes the direct free kick. 66:44 Foul by Ricardo Gardner on Alex Oxlade-Chamberlain, free kick awarded. Direct free kick taken by Nico Yennaris. 64:37 Ivan Klasnic gives away a free kick for an unfair challenge on Nico Yennaris. Lukasz Fabianski takes the direct free kick. 63:44 Mark Davies gives away a free kick for an unfair challenge on Yossi Benayoun. Francis Coquelin takes the direct free kick. 62:59 Mark Davies produces a right-footed shot from just outside the box that misses to the right of the net. 61:40 Free kick awarded for an unfair challenge on Mark Davies by Emmanuel Frimpong. Direct free kick taken by Gael Kakuta. 61:12 Effort from outside the area by Ivan Klasnic goes wide right of the goal. 60:37 Substitution David Ngog is brought on as a substitute for Darren Pratley. 59:39 The assistant referee flags for offside against Ivan Klasnic. Sebastien Squillaci takes the indirect free kick. 59:13 Tuncay Sanli takes a shot. Save made by Lukasz Fabianski. 55:51 Andrey Arshavin provided the assist for the goal. 55:51 GOAL - Chu-Young Park:Arsenal 2 - 1 Bolton Chu-Young Park gets on the score sheet with a goal from inside the box to the bottom right corner of the goal. Arsenal 2-1 Bolton. 52:37 Assist by Yossi Benayoun. 52:37 GOAL - Andrey Arshavin:Arsenal 1 - 1 Bolton Andrey Arshavin gets on the score sheet with a goal from inside the six-yard box to the bottom left corner of the goal. Arsenal 1-1 Bolton. 51:46 Outswinging corner taken by Gael Kakuta, save by Lukasz Fabianski. 50:48 Ivan Klasnic takes a shot from close in clearing the crossbar. 47:57 The assistant referee flags for offside against Chu-Young Park. Adam Bogdan restarts play with the free kick. 46:31 Assist by Darren Pratley. 46:31 GOAL - Fabrice Muamba:Arsenal 0 - 1 Bolton Fabrice Muamba fires in a goal from inside the area high into the middle of the goal. Arsenal 0-1 Bolton. 41:40 Gael Kakuta takes a inswinging corner from the right by-line to the near post, clearance made by Francis Coquelin. 40:55 Corner taken by Andrey Arshavin from the right by-line to the near post, Ivan Klasnic makes a clearance. 40:22 Outswinging corner taken by Andrey Arshavin, Gretar Rafn Steinsson manages to make a clearance. 40:08 Chu-Young Park takes a shot. Save by Adam Bogdan. 37:28 The assistant referee signals for offside against Darren Pratley. Sebastien Squillaci restarts play with the free kick. 35:57 Effort from outside the penalty box by Andrey Arshavin goes wide right of the target. 35:22 Andrey Arshavin takes the inswinging corner, Ivan Klasnic makes a clearance. 35:09 Thomas Vermaelen takes a shot. Save by Adam Bogdan. 34:18 Foul by Ricardo Gardner on Alex Oxlade-Chamberlain, free kick awarded. Direct free kick taken by Andrey Arshavin. 32:31 Effort on goal by Yossi Benayoun from deep inside the penalty area misses to the right of the goal. 30:43 The official flags Chu-Young Park offside. Adam Bogdan takes the indirect free kick. 28:13 The official flags Tuncay Sanli offside. Free kick taken by Lukasz Fabianski. 26:19 Zat Knight takes the direct free kick. 26:19 Booking Sebastien Squillaci is shown a yellow card. 26:12 Foul by Sebastien Squillaci on Ivan Klasnic, free kick awarded. 24:38 Gael Kakuta takes a shot. Save by Lukasz Fabianski. 23:58 Chu-Young Park takes a shot. Adam Bogdan makes a save. 21:58 Darren Pratley has a headed effort at goal from close range which goes wide left of the target. 21:42 Short corner worked by Gael Kakuta. 21:29 Darren Pratley takes a shot. Save by Lukasz Fabianski. 18:51 Gael Kakuta fouled by Yossi Benayoun, the ref awards a free kick. Direct free kick taken by Mark Davies. 17:54 Chu-Young Park is caught offside. Adam Bogdan restarts play with the free kick. 16:58 Unfair challenge on Thomas Vermaelen by Ivan Klasnic results in a free kick. Direct free kick taken by Yossi Benayoun. 13:23 Sebastien Squillaci concedes a free kick for a foul on Darren Pratley. The free kick is swung in right-footed by Tuncay Sanli. 10:47 The referee blows for offside against Andrey Arshavin. Indirect free kick taken by Adam Bogdan. 9:53 Corner taken by Andrey Arshavin from the right by-line, Zat Knight manages to make a clearance. 9:33 Free kick awarded for an unfair challenge on Emmanuel Frimpong by Fabrice Muamba. Sebastien Squillaci restarts play with the free kick. 6:56 Corner taken by Andrey Arshavin. 4:24 The referee blows for offside. Lukasz Fabianski takes the free kick. 0:40 Andrey Arshavin concedes a free kick for a foul on Gretar Rafn Steinsson. Direct free kick taken by Gael Kakuta.